LOWER EAST SIDE — Throwaway items common to all New Yorkers — takeout containers, sipping straws, plastic shopping bags — provided the raw materials for artists in a new gallery exhibit that brings fresh meaning to the concept of recycling. Upcycled, a showcase of seven artists' sculptures that utilize everyday plastic pieces, opened last week at the nonprofit Educational Alliance on East Broadway. The exhibition is the brainchild of artist and curator Barbara Lubliner, who began experimenting with plastic bottles in her studio and found that the medium lent itself to broader patterns in nature. "They're taking this material that is sort of trash, noxious, and transforming it into something that really creates an aesthetic experience," said the artist, who worked on a similar project at Greenwich Village's First Presbyterian Church, where she and others designed trees topped with plastic bottles that included solar panels to light the sculptures. In Upcylced, the artists employed everything from empty detergent bottles to discarded air-conditioning covers to bottle caps to form their colorful sculptures. "I've always resisted recycling shows, because it's like the third grade, use the Clorox bottle and make a pig," said Walter O'Neill, director of the Educational Alliance's art school and gallery. But in this show, "every one of them is so cool," he said. "It's the most ephemeral thing blowing in the street." Lubliner added that even employees from the Alliance who don't always take an interest in the exhibitions have been approaching O'Neill to tell him how much they enjoy show. She explained that elevating items most people consider waste into a form of artistic expression — especially given the area's reputation for not having the most sanitary streets — helps transcend more traditional ideas of what art can be. "In the local community, it's inspiring that conservation about trash-beautifying," she said. "Some of the teenagers [visiting the show] said, ‘Wow, I want that in my room.'" 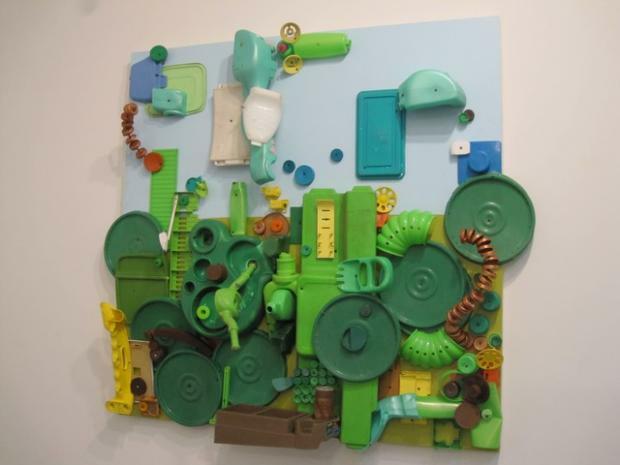 Upcycled runs through Jan. 20 at the Educational Alliance's Ernest Rubenstein Gallery, 197 E. Broadway.